Summer 2016 and we performed Orchestra of Samples in the UK city of Leicester for the Journeys Festival, who’d introduced us to Iranian percussionist, composer and producer Arian Sadr, who performed the show with us. So given a spare few hours in the afternoon, we did a recording session with Arian in the BBC Radio Leicester building, where the artists ‘backstage’ was set-up. Born in Iran, Arian grew up fascinated by Persian percussion, learning to play from the age of seven. 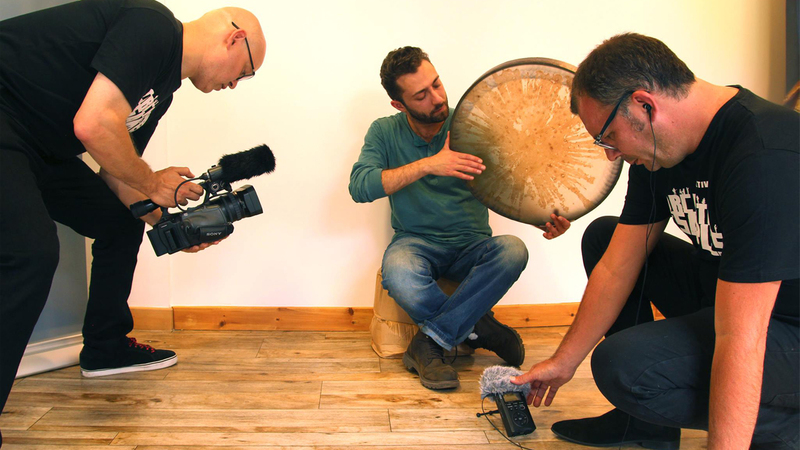 He studied Tonbak (the Persian goblet drum) and the Daf (the large circular frame drum) and in 2003, while still a teenager, he left Iran and headed to the UK to study music professionally. As well as now being an experienced composer and producer, Arian also performs as both a solo artist and as part of groups, most notably the World Music Network award winning act Haymanot Tesfa trio with Ethiopian singer Haymanot Tesfa and Egyptian multi-instrumentalist Mina Salama. Arian was also previously a member of the Manchester International Roots Orchestra. He also now teaches Persian drumming skills with workshops, one-to-one lessons and in schools and community groups. With big thanks to the Journeys Festival and BBC Radio Leicester.